Crossing a Maltese with a Shih Tzu results in a hybrid dog known as the Mal Shi. Your puppy will share characteristics of both parents. Since both parents are toy dogs, taking care of a Mal Shi puppy isn't different from caring for other small dog breeds. Perhaps your Mal Shi will inherit his Maltese parent's soulful eyes. 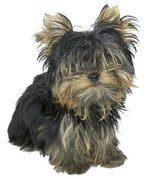 The Mal Shi might look like a combination of the Maltese or the Shih Tzu, or resemble one parent more than the other. The pure white Maltese, one of the world's most ancient breeds, doesn't weigh more than 7 pounds when full grown. He sports a long, silky, single coat. The Shih Tzu stands between 8 to 11 inches tall at the shoulder at maturity, weighing between 9 and 16 pounds. The Shih Tzu coat is long, but double-coated, and appears in any color. It's likely your Mal Shi will weigh more than the Maltese, but less than the larger Shih Tzu. He's more likely to sport at least one additional color in his coat rather than be solid white. Expect to spend a lot of time grooming your little friend, no matter whose coat he inherits. The American Kennel Club describes the Maltese as "charming, gentle and playful," and calls the Shih Tzu "affectionate, outgoing and ... playful." Your Mal Shih puppy should have a good disposition, getting along well with other dogs and cats. He's a smart dog, willing to learn and eager to please. Since your Mal Shi is so small, he's not a good dog for young kids, but makes a good pet for older children. If he inherits some of the fearlessness of the Maltese, he could try to take on dogs far larger than he is. With the mischievous nature of the Shih Tzu in his DNA, he might occasionally make off with your belongings, expecting you to give chase. Toy breed puppies are prone to hypoglycemia, potentially life-threatening low blood sugar. Prevention requires feeding the puppy every few hours, up to six times daily. That means you can't leave him on his own for most of the day while you go to work. You could return to an unconscious puppy, or one experiencing seizures or a cold body temperature. In a worst case scenario, the puppy expires. Immediate treatment for low blood sugar consists of rubbing the puppy's gums with a small amount of corn syrup or the supplement Nutrical. You must bring your puppy to the vet immediately. Fortunately, once your puppy is about 3 months old, the risk of hypoglycemia lowers considerably. Feed your Mal Shi a quality dog food recommended by your vet, preferably one designed for small breeds. Be careful with treats; it's easy for small dogs to become overweight. Always provide your Mal Shi with access to clean, fresh water. Your Mal Shi's exercise needs are relatively modest, but resist the urge to carry your puppy everywhere and let him learn to walk on a lead. Always attach the leash to a harness rather than a collar. It often takes longer to house train toy breeds, but remember that patience is a virtue. Take your Mal Shi to puppy kindergarten classes for socialization and basic obedience training. He should do well, as he's naturally bright and sociable.